When I ran the first backup job on the newly installed HP LTO-5 Ultrium 3280 Tape drive, it gave an interesting alert. Apparently since LTO4, the drive has a sensor to check whether there is a tape in the slot or not. 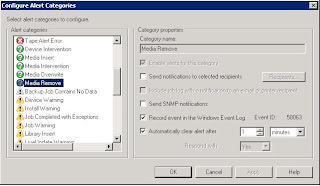 If you have set the job to automatically eject the media, then BackupExec will not complete the job until you manually remove the tape from the drive, even though it is ejected, OR respond to the alert. 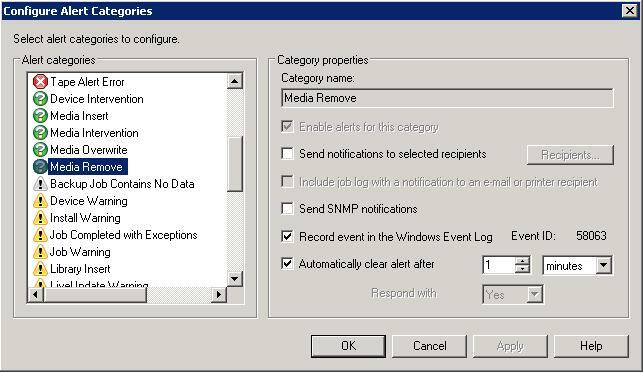 The solution is to create an automatic response to this specific alert, telling BackupExec to clear the alert when it comes up. This will enable the job to complete successfully. (Server: " BackupSVR ") (Job: "Full Daily Backup") Please remove the media from the drive, and Respond OK. Thanks - just upgraded to 2010R3 and suddenly got this weird issue - that fixed it!